I am a lover of all things maple. When others were enjoying their PB&J sandwiches as kids; mine were always PB&MS – Peanut Butter and Maple Syrup. Haven’t tried it? Go. Now! I STILL love it to this day (chips on the side)! Fast forward a couple of years (yes, that was supposed to make you chuckle) and nothing has changed, well, except that the maple syrup of my youth really wasn’t and now that I know the difference I’m even more rabid in my love and devotion. Yes, I have been known to swallow a spoonful all by itself, without excuse of a cold or sore throat to cover my tracks. I mean I LOVE it. It was absolutely perfect for this Maple Roasted Butternut Squash Risotto with Bacon and Brown Butter Sage Topping. So, when asked by the powers that be at Crown Maple Syrup if I would like to try my hand at using their product in a sweet and savory way for their Tap to Table Crown Maple Challenge (#TaptoTable) I was game. I’ve done it before. Witness my Maple Bourbon Bacon (you wish you could witness it for real…it is such an ideal mix of savory and sweet! ), Maple Bacon Biscuits, Maple Bacon Cupcakes and just recently this divine Maple Bourbon and Balsamic Caramel Sauce. Wow…are you seeing the trend I’m seeing? I obviously REALLY like it paired with bacon…and bourbon. No wonder my book is going to be titled Maple Bacon Bourbon EVERYTHING? (Just kidding, no book). I received samples of Light, Medium and Dark Amber syrups; all certified organic and at their suggestion decided to use the Medium Amber for this dish. I thought it was perfect. This was a great blend of sweet and savory; bites of maple roasted squash mingled with salty bacon and just right risotto and I know my taste testing might have been a bit more than actually required. You know, it was ALL about quality control! Challenged to combine sweet and savory is almost too simple when working with butternut squash; it’s simply meant for pairing with a bit of sweet. Roasted with a combination of olive oil and maple syrup resulted in cubes of deliciousness…adding just a hint of syrup to the butter and crispy sage topping was a good call; I seriously could have eaten that topping with a spoon. OK, maybe I did; no judging allowed. Using the last of the sage was perfect too; it’s just about ready to call it quits for the year and the leaves, while not as pretty as when it’s thriving, made for perfect fried sage. 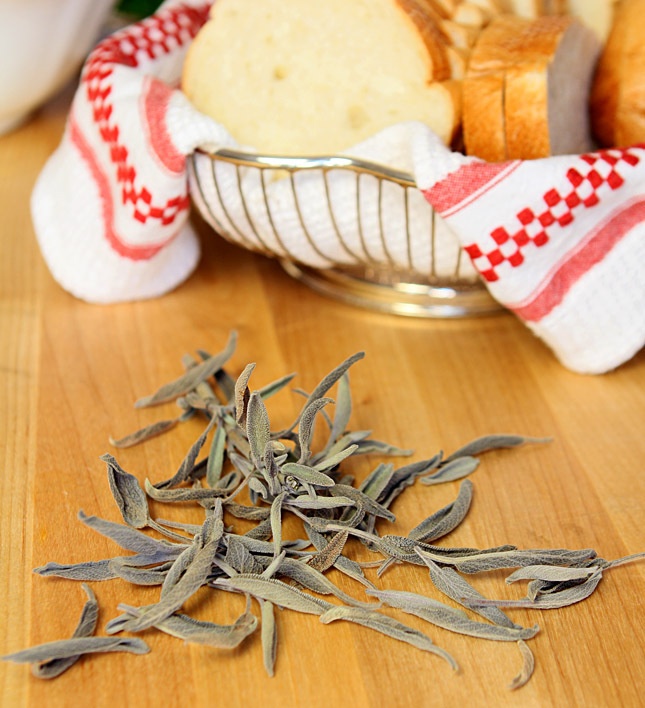 If you’ve not tried using fresh sage, you must. It’s a super hardy plant and we always have a ton of fresh sage available for our Thanksgiving dishes and can harvest some for Christmas as well…the difference in taste between dried and fresh is pronounced enough I don’t even consider them equal! In our home, Christmas is not the same level of food craziness as Thanksgiving. For as long as I can remember I wanted the day focused on my family spending time together; taking our time to open gifts, enjoying a leisurely breakfast and then a day of movies and Scrabble (OK, my girls did not LOVE that as much as I did!). I wanted good food but not something that I had to attend to all day. Nothing about that has changed and this dish was perfect with a salad and an easy and tasty ham sandwich on the side. I enjoyed my holiday dinner this year with my friend Abbe and her husband Ed; you should go check out Abbe’s blog; everything she made was delicious and I hope to re-create some of her snacks soon…that crunchy Chex mix with the unexpected flavors tops the list. I could have eaten the whole bowl; shhh, don’t tell but maybe I did? Place the butternut squash on a rimmed baking sheet. Drizzle with olive oil and maple syrup. Sprinkle with salt and pepper. Toss well to coat all evenly. Roast in the oven for 20-30 minutes or until a fork can easily pierce through the squash. Remove from oven and set aside. Meanwhile, heat 4 quarts (16 cups) chicken stock in a pot until just simmering. Cover and continue to let it simmer. Heat a large pot over medium high heat. Add enough olive oil to fully coat the bottom of the pan. Add the onions to the pot and reduce the heat to medium. Season with salt and pepper and saute until they are translucent and softened. Add the garlic and let it cook for two or three minutes until the garlic just starts to brown. Add the rice and continue to cook for three or four minutes until the rice is fully coated with the oil and has just started to brown ever so slightly. Pour in the white wine and stir constantly for a minute or two, until the wine is almost fully evaporated. Pour a ladle of the stock over the rice. Stir well to make sure that all the rice has lifted off the bottom of the pan. Sip a bit of that white wine (why yes that IS am important step!). Once the liquid has almost fully evaporated in pan, add another ladle full and repeat. Continue this process until all of the stock has been incorporated into the risotto. Take a taste to insure the rice is tender but still a little firm in the middle. Turn off the heat and stir in the bacon and Parmesan cheese. Add the roasted squash, stir gently to combine with the risotto and adjust the seasoning with salt and pepper to taste. Cover and let rest up to 15 minutes. While the risotto is resting warm the butter in a saute pan over medium heat. Let this cook for a minute or two just until the butter has started to brown. Add the sage and let cook for a minute until just crispy. Add a tsp of Crown Maple syrup to the skillet along with the 2 Tbsp of crumbled bacon bits and stir. Remove from heat and set aside. Serve by ladling risotto into bowls. Top with a spoonful of the sage and bacon mixture and drizzle with a bit of olive oil over the top to create a truly luscious texture. Serve immediately. I doubled this recipe; it still vanished! 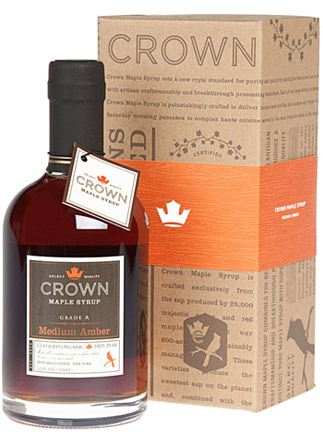 I was provided samples of Crown Maple Sugar and Syrups but all commentary is my own. This looks AMAZING!! We make risotto for New Years, and I want to give this a try. Thank you!! You have managed to create my perfect risotto. You’ve added so many of my favorite things in one place. This needs to be dinner one night soon in my house. Lovely! I’ve done maple syrup and butternut (and acorn) squash loads of times, but never in a risotto. And never with bacon! Sounds totally delish, not to mention good stuff. 😉 Thanks for this. Thanks John…and it was a combination made in Heaven; just perfect if I say so myself! This looks wonderful and a Facebook friend of a friend would be so happy that you used REAL maple syrup! Ok, I’ll quit harping on that. All joking aside, this looks just great. Before you know it, you will be in your new place. I am always available to help get you in there. Just say the word. this recipe makes no sense. The butternut squash disappears after its been roasted and removed from oven. Also you say to saute the onion, and then refer to it and what else? as vegetables? You have two other comments and they obviously didn’t even read the recipe…please correct. While I and other bloggers do our utmost to insure that we have translated our recipes to paper after spending time perfecting them in the kitchen; I admit that ‘being human’ stuff might occasionally see me error during that process and I admit it; I forgot to actually mention adding the squash back into the finished risotto; that’s been corrected. As far as taking an issue with chopped onions being vegetables it seems you are determined to nitpick…I don’t quite see how that could possibly create a recipe that makes ‘no sense’ as I’m certain most readers would have no problem with that reference. Just for you though I’ve changed it. Now, normally, I would actually thank a reader for pointing out these issues but in your case not so much…your authoritarian tone belies the fact that this is MY blog and in return for the effort I make to provide readers with new and/or interesting recipes, I also expect people who comment to show a measure of politeness. Your comment is far from that; what possible benefit could there be for you to take that tone with someone you don’t know. I am not your employee or your child and even in that case your attitude would be unwelcome. Oh. by the way…I checked out your blog too. Very interesting considering you are apparently self appointed as ‘blog police’ that you had in fact stolen my photo of Molasses Cookies from here to use for your recipe here. Now that’s not just an error in including an ingredient; that’s just plain wrong! Please remove that photo from your post immediately. Barb, I’m glad we got together. The risotto was awesome and tonight we will finish it off. That is if i can squeeze in another bite! You didn’t tell me you liked Scrabble. I would have been happy to get out the board but I am much better at gin rummy! Can’t wait to see your new place! Thanks Lizzy…come on over; I have plenty to share. Thanks Prudy; I did have a reader point out (if not particularly graciously!) that I failed to mention when to add the squash back in. I’m betting it’s easy to figure out but add it after you stir in the cheese and bacon bits. Hope you enjoy it as much as we did! 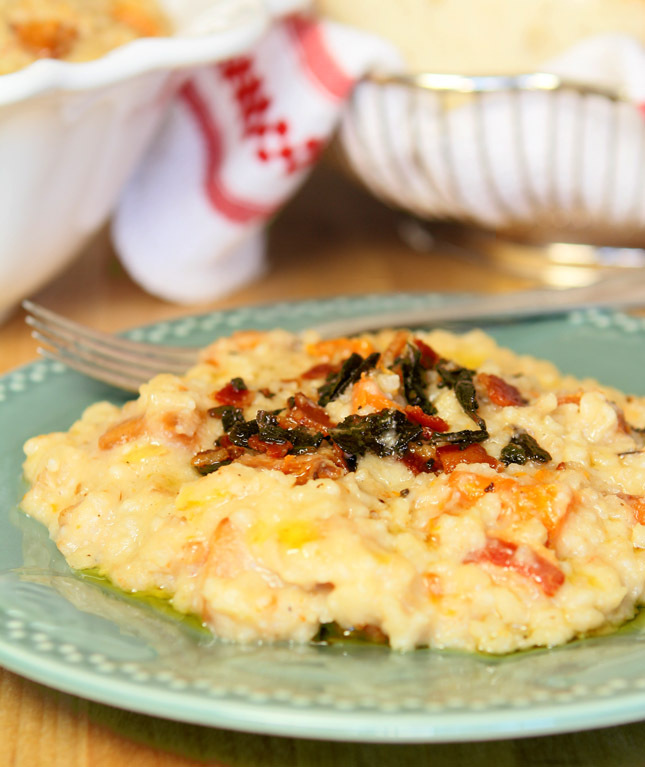 Ok – Maple + Bourbon + Bacon + Browned Butter + Butternut Squash – in risotto form – now THIS is heaven!! !